Nine months into a stalemate that's left Illinois without a budget, Gov. Bruce Rauner Tuesday let loose on House Speaker Michael Madigan. State senators are meeting in Springfield this week. But members of the Illinois House? They're not scheduled to return to the Capitol until April. 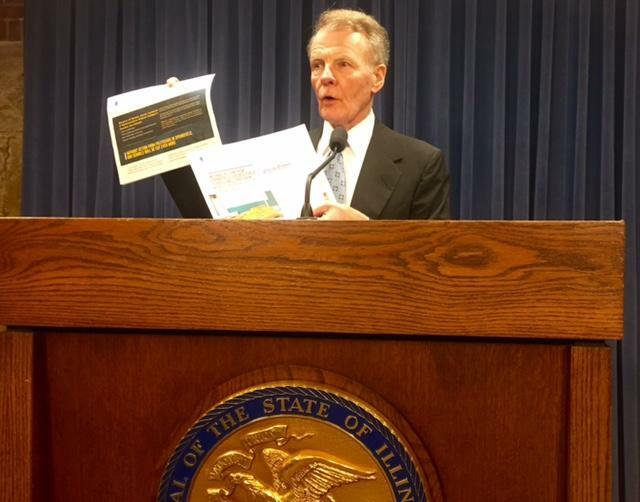 "Speaker Madigan would rather go on vacation. He'd rather have his caucus, the Democrats in the House, go on vacation -- for a month -- while this crisis brews," Rauner said. "And our people are being hurt; our universities are being hurt, our students are being hurt. Stunning failure on the part of Speaker Madigan." That's typical of Rauner's anti-Madigan rhetoric, but there's an irony in his call for more meetings of the House. Whenever they're in session, Democrats have forced the governor's Republican allies to cast politically tough votes. It's typical for legislators to take time to campaign in their districts ahead of elections, like the March 15 primary that's just a week away. Spring breaks over the Easter holiday are also common. However, it's rare that legislators stay away from the statehouse for a full month during their regularly session period, which runs from roughly January through May. And Illinois has never before been in this extreme a situation with its budget, or lack thereof. Madigan's spokesman, Steve Brown, calls Rauner's comments “embarrassing," given that the House schedule has been out for months. Brown says the governor hasn't called Madigan for a private meeting since December.